A University of Minnesota student juggled while balancing on a giant red ball. And a clown tried balancing on a high wire while holding a frilly white umbrella, but to no avail. The performers were part of the University’s first-ever Cirque De-Stress event at Coffman Union on Wednesday. Kentucky-based circus troupe Circus Mojo performed seven 30-minute shows in the Great Hall to give students a break from daily stresses, said Paul Miller, the troupe’s founder. 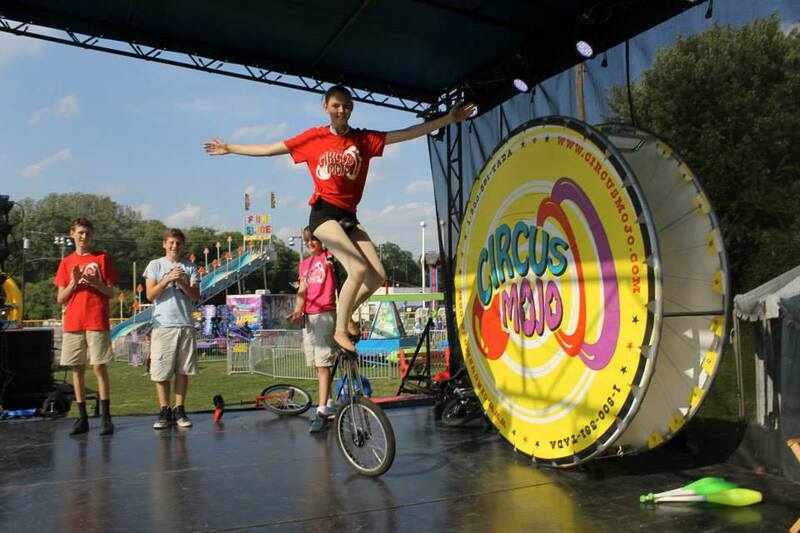 Paul Miller is, as he puts it, “leading the charge” to host an annual College Circus Fest and Job Fair at the headquarters of his Circus Mojo in Ludlow, KY, which is just outside of Cincinnatti) on May 3 – 5. The first night will feature a meet and greet open stage which Miller says is being marketed to college age folks in the Cincinnatti area. The following is a blog post from Raising 2 Tweens. It is written by the mother of one of our students, whom we first met while working our Mojo at Cincinnati Children's Hospital Medical Center. It seems like before our children are even born we are looking for activities to sign them up for. Will I have a soccer player or basketball player? Will they be on the chess team or Odyssey team? Should I sign them up for gymnastics or football? What about science or the drama club? We constantly think about balancing their activities so they are enrolled in something physical, learning to be a team player and using their brains. Before you know it, we have them participating in five or six things and they never have time to just be a kid. I’ve been down this road with Joey, my almost 13-year-old. He has tried soccer, basketball and baseball without success. He has been in chorus, on the chess team, taken a year of Taekwondo and participated in a gymnastics class. He didn’t stick with any of it. Although he liked the chess team and baseball he decided he didn’t want to participate. He has been in Odyssey of the Minds since kindergarten and loves it. But that’s not physical… How do I keep my 5’1, 70 pound boy active? Well, I found the answer this summer. Actually, I found an activity that keeps him active, uses his brain, teaches team work and requires creativity. One activity that covers everything we look for! The Circus! Yes, my son is enrolled in the circus. Circus Mojo in Ludlow to be specific. Joey and I met the Circus Mojo Team at Cincinnati Children’s Hospital while at Joey’s appointments (read story here: Circus Camp Healed My Son. Joey then participated in a summer camp at Circus Mojo. He loved it. It provided the physical therapy he needed for his leg as well as an activity that he enjoyed. His favorite act is the German Wheel. He also enjoys the cable wheel and the silks. These are all very physical activities that have also taught him to work as a team and count on his partner because he could get hurt if he doesn’t. He has also gotten to know a lot of great kids and adults. Coming up with new tricks requires him to be creative. He has to use his brain while spinning plates, flipping hats and balancing objects like feathers and crutches on his finger tips. Saturday classes will pick up again this fall. 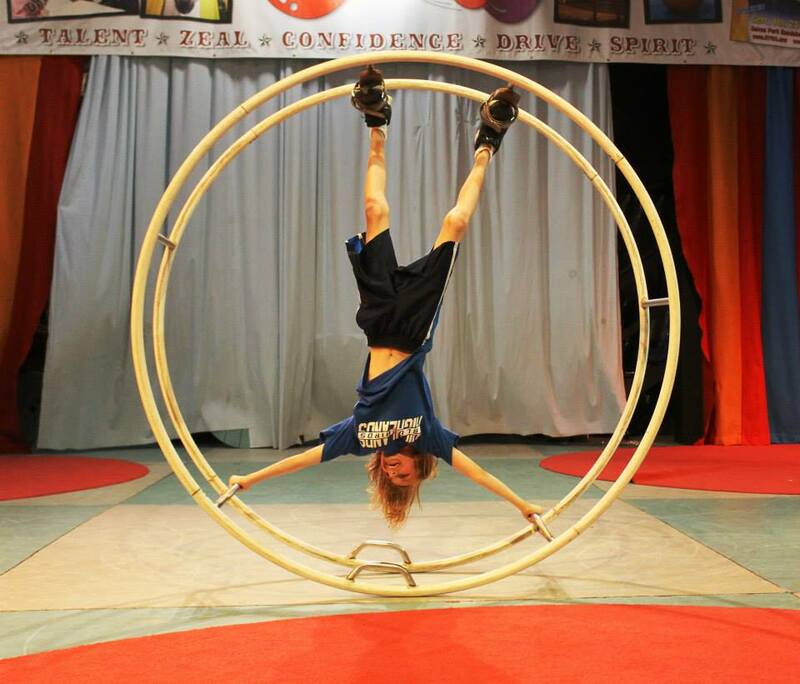 Visit http://www.circusmojo.com or call 859-360-7757 for more information.